Christmas is just ten weeks away!!! The time is certain to fly, so if you are planning to make any gifts for people on your list . . . and/or items to decorate your own home, now is definitely the time to be working on these projects! With this in mind, I was browsing on Pinterest - and found a wonderful angel craft! It is wonderful for several reasons: it is inexpensive! Definitely wonderful! It is simple to make! Definitely wonderful! It is adorable! Definitely wonderful! Just follow this link and you'll find a supply list - you only need wire cutters, pliers, wire and a chapstick tube - and a photo tutorial which takes you step-by-step through the process of making this sweet little angel. It is pretty simple and a craft you could have your grandchildren help you make. 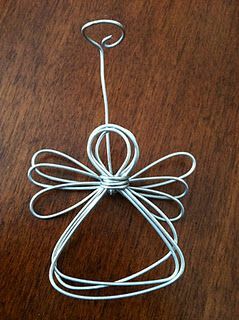 If you used different colored wire you'd be able to make colorful angels! This little angel would be a sweet addition to plates of cookies which you might give your neighbors, friends, family, co-workers, child's teachers . . . and it makes a wonderful gift in and of itself! If you used different colored wire you'd be able to make colorful angels! I'm going to make these for sure! Enjoy!